The General Data Protection Regulations (GDPR) specifies that you must have a simple way for your customers to opt out from receiving bulk text marketing communications from your company. 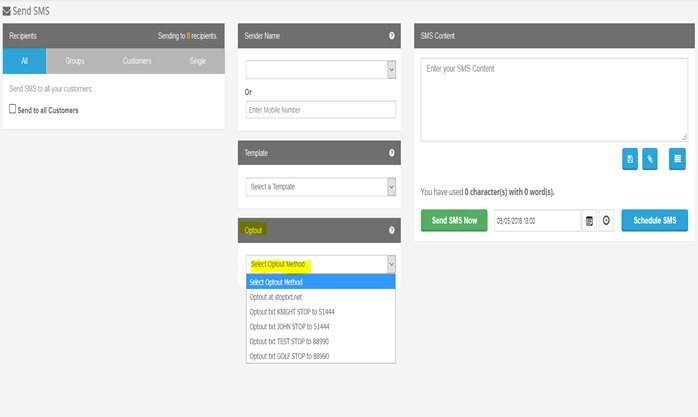 Sendmode makes this easy. When you are sending your messages you will see a new drop-down called Opt Out. This dropdown will be automatically populated with the opt-out options for your account. Some customers may have a mobile keyword enabled for example if so, this option will be available on the opt-out list. When the opt-out option is clicked, the opt-out will be added to your message. The screenshot below shows the new Opt out dropdown. Should you forget to add the opt-out option we will pop up a dialog like we have illustrated in the screenshot below. This article was posted in Blog - All Entries, GDPR and tagged GDPR.